An arctic cold front will bring a round of snow showers by Thursday afternoon, Jan. 24. Lake effect snow showers linger through the night north of U.S. 6. Parts of northern LaPorte, St. Joseph and Elkhart Counties could see an inch of snow, but the heavier totals of 1-3” will be confined to Berrien and Cass Counties. Temperatures will drop to 2° and only warm to 8° on Friday. 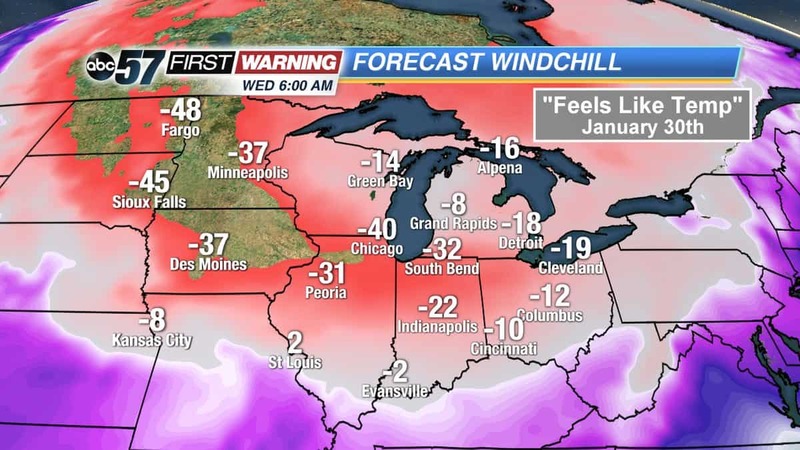 The National Weather Service of Northern Indiana has issued a Wind Chill Advisory to start at 3 a.m. on Friday morning and last until 1 p.m. on Friday afternoon. Another round of light snow showers is likely Friday night with lows again in the single digits. * WHEN...From 3 AM EST /2 AM CST/ to 1 PM EST /noon CST/ Friday. Temps climb to near 20° and into the 20s this weekend and Monday with the best chance of snow coming Monday into Tuesday. That system bears watching as we could see enough warm air surge in to allow rain to mix in. If it stays all snow, accumulations are likely. The coldest air of the season and in several years arrives behind it for next week. Thursday: Mostly cloudy with a chance of snow showers later in the day. High of 25. Thursday Night: Mostly cloudy with a chance of lake effect snow showers. Low of 2. Friday: Morning snow showers possible under mostly cloudy skies. High of 8. Saturday: Mostly cloudy skies. High of 19. Sunday: A 40 percent chance of snow. Mostly cloudy and cold, with a high near 17. Monday: Snow. High near 23. Chance of precipitation is 90%. Tuesday: A 50 percent chance of snow. Mostly cloudy and cold, with a high near 16. Wednesday: A chance of snow. Mostly cloudy and cold, with a high near 2.